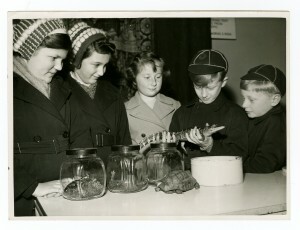 The Society for the History of Natural History (SHNH) and the Horniman Museum are holding a joint meeting on the history of teaching Natural History. This two-day meeting will present the history of different teaching practices and methods for the earth and life sciences, primarily focussing on schools and universities. It will have two major themes: the history of teaching natural history within institutional facilities, and the history of teaching natural history in the outdoor arena. Includes the history of teaching in university field stations, school nature gardens, a school natural history society and the early days of geological instruction. Jim Costa, Director, Highlands Biological Station, NC, USA, Educational outposts: The field station tradition of biological sciences education in the United States. Dawn Sanders, University of Gothenburg, Sweden, Gardens for Learning: The work of Lilian Clarke and C.T. Prime in the development of botanical education in South London. David Robinson, York, Bootham School’s Natural History Society. W. I. (Jim) Kennedy, Oxford University Museum of Natural History, William Buckland’s Oxford lectures in Geology and Mineralogy, 1813-1849. Henry J. Noltie, Royal Botanic Garden Edinburgh, John Hope and the Illustrated Teaching of Botany, Edinburgh, 1761-1786. Speakers will include presentations on the history of teaching of Darwinism, and the history of instructional methods and approaches in the life and earth sciences, as taught in schools, universities and museums in the UK, Sweden and Germany. Poster presentations will also be available at the meeting. Jenny Beckman, Uppsala University, Authors and collectors: Hartman’s Handbook and botanical education in Sweden in the 19th century. Margarita Hernandez Laille, Madrid, Darwinism in classrooms in Victorian England. George Fussey, Eton College, Natural history at Eton and beyond. Mark Carnall, Grant Museum of Zoology, University College London, The trials and tribulations of ‘just a teaching collection’. Dominik Huenniger, the Göttingen Institute of Advanced Study, Germany, Johann Christian Fabricius (1745 – 1808), his natural history textbooks and his ideas on natural history university education. Nathalie Latour, Maisons Laffitte, France. Historical three-dimensional representations as a support for teaching in Natural History. Leonie Sedman. University of Liverpool, Anatomical Teaching Models – A Call for Information. Alicja Zemanek. Jagiellonian University, Kraków, Natural history teaching at Cracow and Vilna universities (the 18th/19th centuries). download the Registration form The History of teaching Natural History and return to the SHNH Meetings Secretary. The Horniman Museum is a short uphill walk from the station at Forest Hill with bus connections (176, 185,197 & 356) from outside the station. London Bridge Rail station (Northern line underground) via Southern Rail Canada Water (Jubilee Line underground) using London Overground. Accommodation suggestions within 30mins to one hour of the Horniman Museum & Gardens, Forest Hill, London.